You already know we watch and enjoy Chip and Joanna Gaines fix up houses in Waco, Texas. We can’t help being inspired by their work. With each fixer-upper they show the future home owners, Joanna describes what she would do to that pathetic, run-down, closed-in domicile to make it more livable and enticing. She uses phrases like “knock out that wall” and “take down that popcorn ceiling” and “add French doors on that wall.” We live in a house built in 1905 (I called the county tax assessor to find out). Mauri and Margaret-Rose bought it in 1980 from its first owners, two sisters who grew up in it! Through all these years it has been updated regularly enough that it never reached the point of being considered a fixer upper. Still, a sliding door we installed when the West Wing was built 22 years ago gave up the ghost many years ago. The window went cloudy like that ages ago. 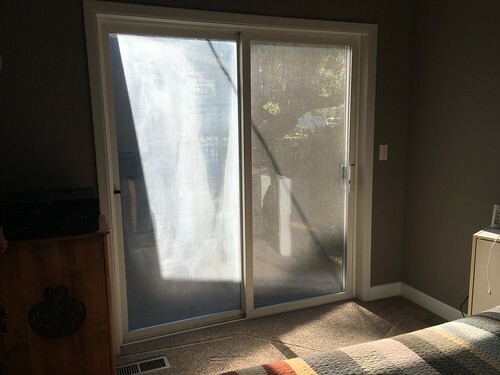 We’ve always used this privacy screen, rescued before it hit the trash pile at Newberg Friends Church, instead of drapes. 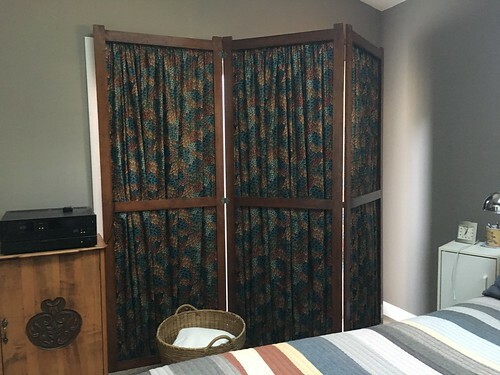 I’ve changed the fabric inserts to coordinate with the color of our bedspread at the time. (I guess it won’t matter to you that it is upside down in this picture.) So the only time we noticed how bad the slider looked was on those occasions we sit on our back deck (now and then). 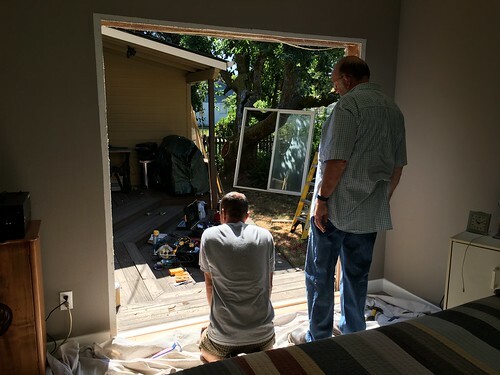 We’ve been doing all this other fixing up lately (updated cookin’ room, paint, new flooring); maybe we should replace that sliding door! But wait! I say, channeling Joanna Gaines. 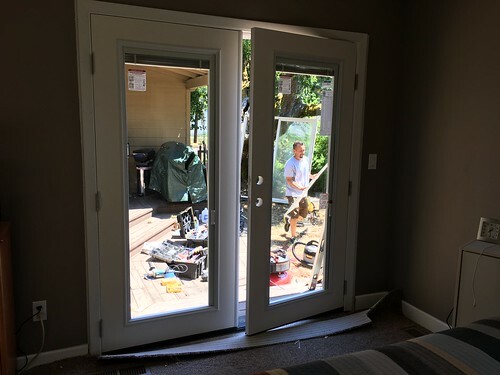 We should install French doors! Off to Home Depot! Because surely they make standard French doors the same measurements as standard sliding glass doors. Yes, we were told. But when Ezekiel came to measure, he was quite certain we’d need to have doors custom made. Which also meant we had to wait. Installation day finally came—yesterday! It took most of the day . . .
everything was in place (except for the carpet). Those mini-blinds are between layers of glass and we’re going to hope will never need to be cleaned! No need for the big dark screen anymore and a much more spacious feel. Hmmm. Something I didn’t consider until this moment. We won’t be “cracking the window” for fresh air anymore, will we? Unless we don’t mind being eaten alive by mosquitoes. Oh well, you gain and you lose. 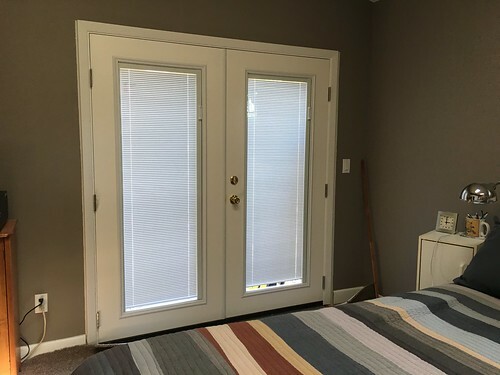 They make a screen door for this application that draws on a roll from one side to the other, like a pull-down shade, only horizontal and screen. I looked into them a few years ago for our AZ house. A bit pricey, but a solution.